Senator Johnny Isakson has always demonstrated a commitment to unlocking cures and treatments for diseases like cancer. On May 24, 2017, Georgia Senator Johnny Isakson submitted remarks into the Congressional Record recognizing Winship Cancer Institute's new National Cancer Institute (NCI) Comprehensive Cancer Center designation. 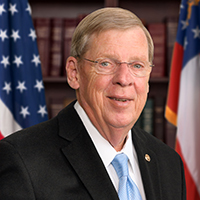 In his remarks, Isakson stated: "Today Winship continues to stand out because of its commitment to aligning its outstanding cancer research and education initiatives with its significant cancer prevention and cancer care efforts. I am proud to congratulate Winship Cancer Institute on this important milestone, as its researchers and clinicians continue their mission to lessen the burden of cancer for the citizens of Georgia." During his long tenure in Washington, Isakson has been an avid supporter of Winship. He sponsored Senate Resolution 459 to recognize the importance of cancer research and designated May 2016 as "National Cancer Research Month." He was also integral to the passage of the 21st Century Cures Act that seeks to maintain America as the global leader in biomedical innovation. Isakson has always demonstrated a commitment to unlocking cures and treatments for diseases like cancer. "Senator Isakson was highly supportive of Winship's initial application for NCI designation when we first applied in 2009," says Walter J. Curran, Jr., MD, Winship's executive director. "His letters of support and his enthusiasm in Washington were critical and continue to be to this day."